Lucknow: The First Lady of South Korea Kim Jung-sook on Tuesday evening was witness to the lighting of over 3 lakh earthen lamps on the banks of the Saryu as well as the change of name of Faizabad district to Ayodhya. The grand spectacle is part of the second edition of ‘Deepotsava’ initiated by the state BJP government. 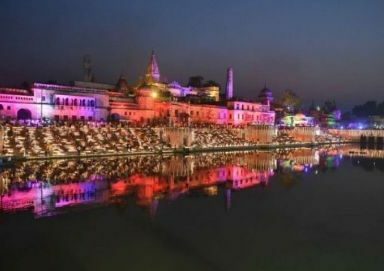 With the lighting up of 3,01,152 ‘diyas’, officials said, the spectacle at the ghats of the river had also entered the ‘Guinness book of World Records’. Chief Minister Yogi Adityanath and the South Korean First Lady also performed ‘aarti’ of the holy river as people clapped and cheered. The ‘Ram ki Paidi’ was lit up in purple, red and yellow lights and a laser show based on the life of Lord Ram was also displayed for the cheering thousands. The Korean First Lady earlier laid the foundation stone for a Queen Hau memorial park to be built jointly by the state and the South Korean governments. Uttar Pradesh will spend Rs 24.66 crore on the ambitious project aimed at increasing foreign footfalls in the temple town and also strengthening the cultural bonds between UP and South Korea. Chief Minister Adityanath in his address announced the setting up of a medical college in Ayodhya which will be named after the erstwhile king of Ayodhya, Dashrath, and also an airport which will be named after Lord Ram. The Chief Minister said the identity of the district of Faizabad was Lord Ram and he declared thereafter that the Faizabad district would now be known as Ayodhya. The first lady of South Korea also welcomed the characters of Lord Ram, Sita, Lakshman as they alighted from a chopper for a special theatrical performance.